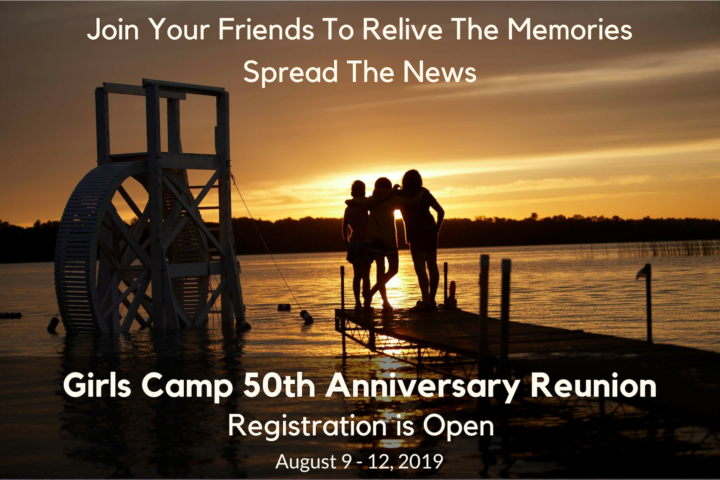 We are excited to be celebrating the Girls Camp 50th Reunion this summer! It has been ten years since we opened our doors and invited everyone back for a celebration. Time flies and we can’t wait to see everyone! This is a big one, so don’t miss it. We hope you will return to the shores of Lake Plantagenet with friends to relive your years as a camper or staff member. We plan to include favorite camp moments such as council fire, specialty day meals (maybe a bit less sugar) and final banquet (think grasshopper pie) while offering a typical day of camp activities. Bring your tennis shoes and be sure to stretch and get fit so you are ready to play Dutch Auction for evening program. In addition to all the fun, we plan to celebrate and honor Carol’s leadership at Thunderbird. Retirement started for Carol in 2008, and we have been waiting all this time to throw her a retirement party. So, grab your friends and spread the word. We want the cabins to be overflowing. Speaking of cabins, if you are worried about sleeping in an old bunk, don’t fret. We scrapped all the metal bunks in the camper areas, built wooden bunks and replaced the mattresses. It isn’t the Ritz, but the beds are definitely more comfortable from our loving sling mattress days. If you long for that hammock feel, you can look forward to hammocks around camp. In the past few years, we have added a lot of “hanging out space” around camp. So, if all you want to do is spend time visiting with friends, you will enjoy lakeside spots such as the tree fort, swings, hammocks and more. It all will feel familiar with a fresh new look. If you are interested in bringing your family, we are running Family Camp at the same time as the reunion. The Girls Camp reunion housing is for girl alumni campers and staff. If you would like to bring your family along for a bit of camp fun, please register the entire family for family camp. Those who sign up for family camp will not need to pay the reunion fee. Please still register for the reunion so we know to expect you. ARRIVAL: Friday, August 9th-after 5:00 for time with friends, heavy appetizers and s’mores. DEPARTURE: After breakfast on Monday, August 12th. If you are attending the reunion and staying off site, your daily rate is 97.00. Please contact the camp office on how to remit your payment. Be sure to join the Camp Thunderbird fan page on Facebook and then note you are coming to the reunion. We want everyone to see who will be attending. Questions? Don’t hesitate to call the winter camp office: (314) 647-3168. Share the news far and wide!